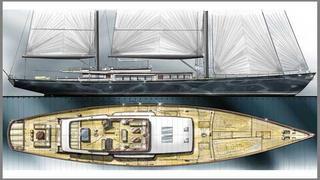 Barracuda Yacht Design has completed pre-production plans and drawings for a ketch reminiscent of classic yachts from the 1940s and 1950s. The design was requested by Turkish yard Ocean Survey Services, on behalf of a client looking to replicate the emotional resonance and beauty of a bygone age. It has traditional proportions in the bow and stern with moderate overhangs and a classic-looking white painted deckhouse with varnished timber trim. Unusual amongst similarly themed concepts, the design also bows to modern lifestyle requirements, with a discreet fly bridge atop the deckhouse and twelve large windows down the length of the hull. It features a modern underwater profile, options for a retractable dagger-board, furling rig with single point sheeting arrangements and self-tacking, furling staysail – all aimed at comfort, performance and ease of handling. Above all, the accent is on simplified installations and an efficient build process where possible. The flybridge features a weather protected space for seating forward, twin helm positions at the mid-point and a spa pool and sun-bathing space at the rear. A simplified and clean-looking foredeck houses two under-deck tenders of 6.8m and 9m, launched and recovered via a concealed crane. Combined with the yacht’s port side diving centre, this set-up is designed for scuba and water sports enthusiasts who need to handle lots of equipment. The lower deck accommodation includes a full beam owner’s suite with separate office, plus four generous en-suite guest spaces. In the centre of the yacht, fold-down platforms on either side of the hull create a starboard beach club and port diving centre. Under sail the yacht has a flexible and easy to use sail plan, designed to cope with a wide range of conditions. For light to moderate wind strength of up to about 25 knots, the yacht will use a large furling genoa and for wind strength up to 40 knots, the yacht will use a self-tacking, inner furling staysail, acting like a storm jib if required.